The <menuitem> tag specifies a command/menu item which the user can request from a popup menu. 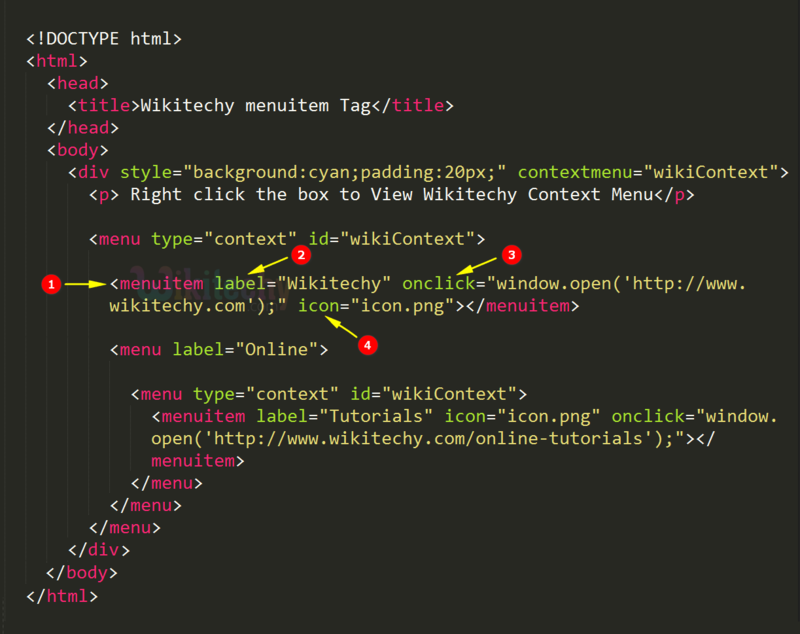 The <menuitem> tag supports Global Attributes and Event Attributes. The <menuitem> tag is not supported. <menuitem> tag used to define a menuitem in a <menu> element . label attribute used to define the name to be shown in the menuitem. onclick event opens a new window. icon attribute is used to set the icon for the menuitem. 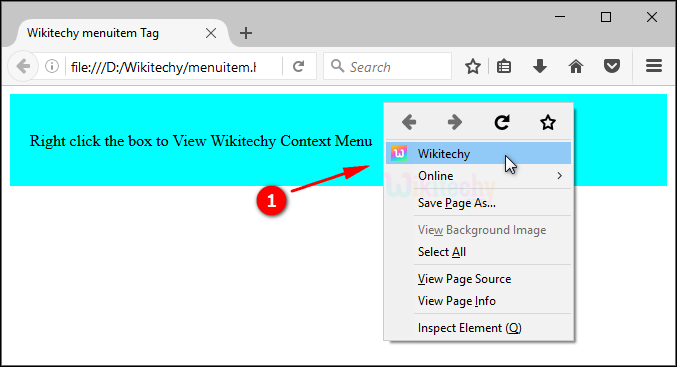 When User right click over the box the context menu appears with the “wikitechy” menuitem. The <menuitem> has its sub menu Online-> Tutorials. When User Click the Tutorials menuitem. 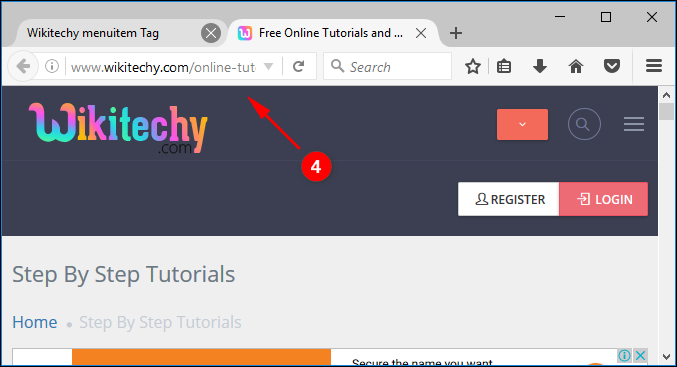 The online tutorials page of wikitechy will be appears. label text No Yes Provides the name of the command/menu item, as displayed to the user. radio No Yes Describes that the type of command/menu item to show. checked checked No Yes Defines if the command/menu item have been checked though the page loads. icon URL No Yes Provides an image for the command/menu item. radiogroup groupname No Yes Describes the name of the group of commands which will be switched though the command/menu item itself is switched. default default No Yes Points the command/menu item as being a default command. disabled disabled No Yes Defines if the command/menu item should not be displayed. 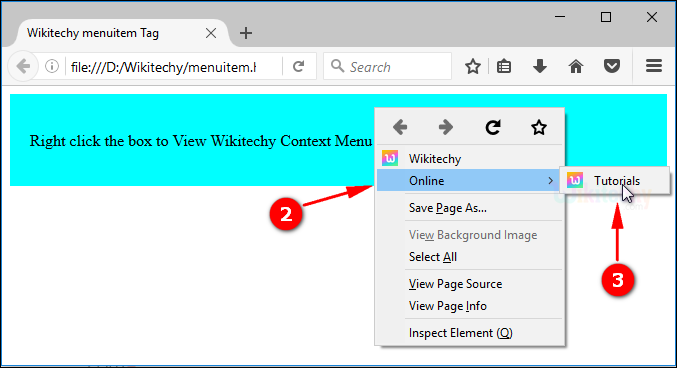 The <menuitem> tag is only supported in Firefox. The <menuitem> tag is only works for context menus.